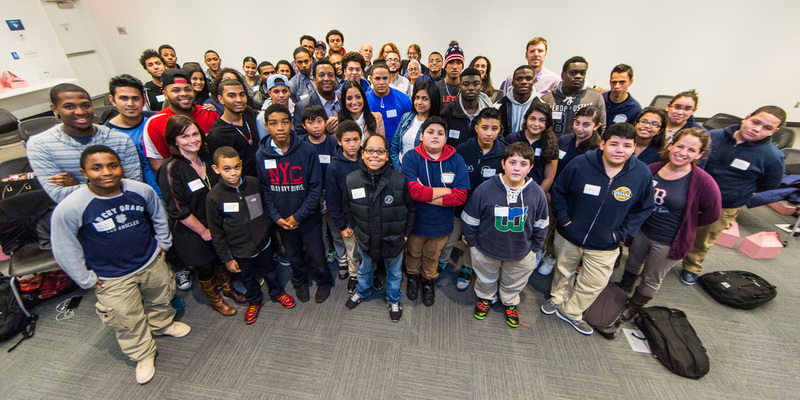 On November 19th, a group of of young people had the opportunity to go to the Edward M. Kennedy Institute to be part of a public conversation with Pedro Martinez. The 8-time All Star, 3-time Cy Young Award winner, and newly inducted Baseball Hall of Famer dominated opponents from the mound for the Red Sox from 1998-2004. He was part of the 2004 World Series Championship team which delivered a stunning come-from-behind victory 86 years in the making. In an interview prior to the event, Pedro talked about how proud he was to be a part of Boston’s Latino community; “I am Lynn, I am Jamaica Plain, I am Lawrence, I am Providence, I am Roxbury. The best moments of my career happened in Boston and I will always carry them in my heart,” he said. One young person immediately started reading “Pedro,” Pedro Martinez’s autobiography (that he got at the event) and was enthralled in learning all about Pedro’s childhood in Manoguayabo, outside of Santo Domingo in the Dominican Republic. A St. Stephen’s Youth Programs alum talked about meeting Pedro as a lifetime-best experience. In other relevant baseball news from November 19, a bust of Puerto Rican hero Roberto Clemente was installed adjacent to the Blackstone School in the Puerto Rican Veterans Monument Square in the South End Clemente played for the Pittsburgh Pirates from 1955-1972, winning 12 consecutive Gold Glove awards, batting over .300 for 13 consecutive seasons, and amassing over 3,000 hits throughout his career. He was killed in an airplane crash in 1972 while on a humanitarian mission to Nicaragua and became the first Latin American player to be inducted into the Hall of Fame in 1973.